Writing to the early Christians in Rome, the apostle Paul said, "Do not be conformed to this world, but be transformed by the renewal of your mind, that by testing you may discern what is the will of God, what is good and acceptable and perfect" (Rom 12:2 ESV). Perhaps more than any other New Testament epistle, Paul's letter to the Romans has been the focus of Christian reflection throughout the church's history, transforming the minds and convicting the hearts of believers. Sixteenth-century reformer Martin Luther reflected the church's longstanding emphasis on this portion of the canon: "Let the Epistle to the Romans be the door and the key to holy Scripture for you; otherwise you will never enter into a proper understanding and comprehension of the Bible." 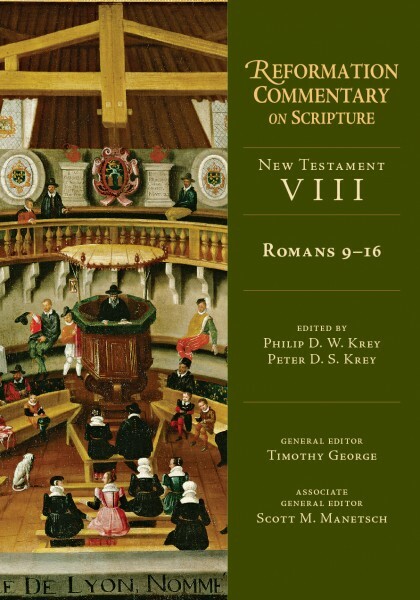 In this volume of the Reformation Commentary on Scripture, Philip Krey and Peter Krey guide readers with care through a diversity of Reformation-era commentary on the second half of Paul's letter to the Roman church. Among the difficult issues addressed by Paul and commented on by early modern exegetes were the predestination of God's elect, the destiny of Israel, the role of Gentiles in salvation history, the ethical demands of the Christian life, and the Christian's relationship to the state. Here, readers will encounter familiar voices and discover lesser-known figures from a variety of theological traditions, including Lutherans, Reformed, Radicals, Anglicans, and Roman Catholics. The volume draws on a variety of resources, including commentaries, sermons, treatises, and confessions, much of which appears here for the first time in English. Gathering together these Reformation-era reflections, it provides resources for contemporary preachers, enables scholars to better understand the depth and breadth of Reformation biblical commentary and aids the ongoing transformation of the minds—and lives—of people today. The Reformation Commentary on Scripture (RCS) provides a crucial link between the contemporary church and the great cloud of witnesses that is the historical church. The biblical insights and rhetorical power of the tradition of the Reformation are here made available as a powerful tool for the church of the twenty-first century. Like never before, believers can feel they are a part of a genuine tradition of renewal as they faithfully approach the Scriptures. In each RCS volume you will find the biblical text in English, from the English Standard Version (ESV), alongside the insights of the leaders of the Reformation. Hear from landmark figures such as Luther and Calvin, as well as lesser-known commentators such as Peter Martyr Vermigli, Johannes Oecolampadius, Martin Bucer, Johannes Brenz, Caspar Cruciger, Giovanni Diodati, and Kaspar Olevianus. The series introduces you to the great diversity that constituted the Reformation, with commentary from Lutheran, Reformed, Anglican, Anabaptist and even reform-minded Catholic thinkers, who all shared a commitment to the faithful exposition of Scripture. Each volume is designed to facilitate a rich research experience for preachers and teachers, and contains a unique introduction written by the volume editor, providing a reliable guide to the history of the period, the unique reception of the canon of Scripture and an orientation to the thinkers featured in the volume. Many of these texts are being published in English for the first time, and volumes also contain biographies of figures from the Reformation era, adding an essential reference for students of church history. If you are looking for the convenience and value of this product in a collection, be sure to check out the Reformation Commentary on Scripture 11-Volume Set.